We strive to be leaders in ethical training techniques for our horses. This means removing the myths around horse behaviour and throwing out terms such as “naughty” or “lazy”. We’re going back to basics – and back to nature – in understanding how and why horses behave in certain ways. Horses form incredibly strong bonds. 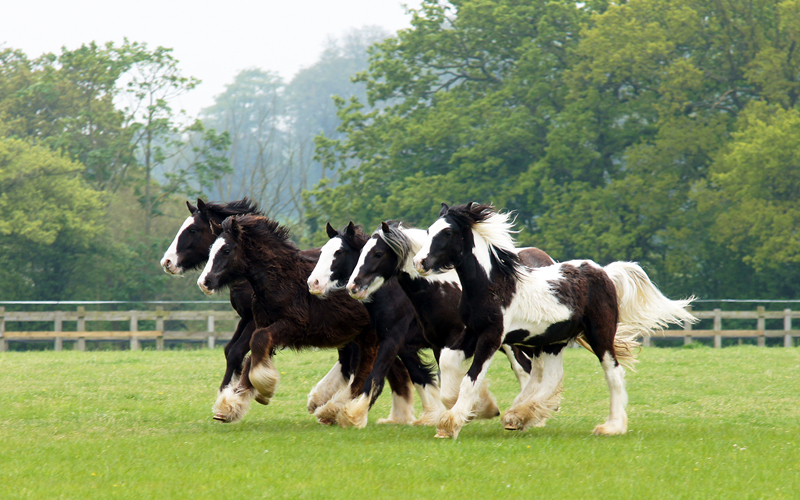 Where possible, our horses live out all-year-round in herds so they can exhibit natural behaviours among their friends. This understanding of the importance of social contact extends to our stabling, management of horse movements, the introduction of new residents to herds, the processes of worming and farriery, and right down to the design of our horseboxes. Often we rescue mares in foal or orphaned foals, so we take particular care with their weaning and socialisation at the Sanctuary. This is a particularly delicate time of a horse’s life and handled in a way so as to cause as little stress as possible. Horses are flight animals and are therefore governed from the legs up. Good leg control is vital to enable our farms teams to carry out day-to-day care of our residents – from leading and loading/unloading to standing for the farrier or vet. We train leg control through positive reinforcement – a reward of a good wither scratch normally does the trick – and negative reinforcement, which is a combination of pressure and release; pressure placed on the lead rope to signal a request for a movement to be performed and release as reward for the behaviour. Did you know horses have photographic memories? We’ve all heard the saying “An elephant never forgets”, well this is the same for horses, which makes consistent and accurate training techniques vitally important. It is difficult for a horse to “unlearn” a fear response to a situation, object, movement or person. At Redwings, we see extreme cases of fearful behaviours as a result of the human hand, but with patience, care and understanding we are able to work towards overcoming these challenges and rebuild the trust between man and horse.